Priced at just $43,500 plus freight and fees the 2018 Discovery Sport is the brand’s entry-level SUV, not to mention one of the most affordable luxury sport utilities available in Canada. On the flip side it’s the most accommodating compact luxury SUV available, thanks to a spacious interior with up to three rows of seats for a maximum of seven occupants, while all of its rivals seat just five. What’s more, with 981 litres of cargo capacity behind its rear seatbacks the Discovery Sport is best in class (by a long shot) for hauling gear. That second row is divided in the usual 60/40 configuration, but unlike many in this class a large centre pass-through creates a 40/20/40-split that’s ideal for loading longer items like skis down the middle while those in back enjoy greater comfort from the outboard seats. With 947 millimetres of second-row legroom the Discovery Sport is also one of the more comfortable for rear passengers, although I must admit to spending very little time back there. I always take a moment to slide into the rearmost seats of any vehicle I’m testing to make sure it’s up to snuff, and the Disco Sport certainly punches above its price point. For instance, the same level of soft touch pampering gets applied to the rear door panels as those up front, while the seats featured identical red-stitched, perforated leather detailing in the Dynamic HSE model tested. Standard across the line, a large, comfortable armrest folds down at centre, integrating dual cupholders and a nice lidded bin on top, while a row of device chargers occupies the backside of the front console, two being five-volt USBs and one a 12-volt socket. Standard in HSE trim, a panoramic sunroof provides plenty of light and an airy ambience for that extra bit of premium presence, while the seatbacks offer plenty of lower back support that should make for hours of complaint-free traveling, at least as far as comfort goes. While all of this is carryover for 2018, the latest Discovery Sport isn’t without its upgrades. Speaking of back support, revised front seats get new four-way powered lumbar adjustment, while an available 12-way powered driver’s seat is even more comfortable. Additional upgrades for 2018 include standard auto-dimming side mirrors with HSE trims, while adaptive cruise control and blindspot monitoring with reverse traffic detection now join lane departure warning (which was new last year) with lane keeping assist as standalone options, or can be had in one of the more comprehensive advanced driver assistance offerings in the segment, the $1,430 Driver Assist Plus package that also includes autonomous emergency braking, road sign recognition and driver condition monitoring, the latter which monitors your eyes and sounds a warning if you get drowsy. This said it’s going to be much more difficult to fall asleep at the wheel of the 2018 Discovery Sport thanks to two new engines. To be specific, there’s really only one new engine albeit two states of tune, both in-house Ingenium gasoline-powered four-cylinders measuring 2.0 litres and featuring direct injection plus turbocharging. The new base engine makes 237 horsepower and 251 lb-ft of torque and comes mated to an updated adaptive shift program-enhanced nine-speed automatic for the most forward gears in the segment, resulting in a 0.6-second quicker sprint from standstill to 100km/h, now at 7.6 seconds compared to 8.2 seconds in the outgoing base model (or 7.9 seconds with the seven-passenger version), while its top speed remains limited to 200 km/h. Being that I was quite satisfied with last year’s Discovery Sport I probably would’ve been more than happy with this performance improvement, but the model I tested was fitted with a high-output version of the new engine that’s good for 286 horsepower and 295 lb-ft of torque, and believe me it’s a lot more energetic off the line. Land Rover says it takes just 6.7 seconds to arrive at 100km/h, and I don’t doubt them, while it now tops out at 221 km/h, a number I wasn’t willing to verify on public roads. Aiding driver engagement is a welcome set of steering wheel-mounted paddles, the nine-speed reacting to input well with clean, crisp, quick shifts when set to Sport mode, found by twisting the rotating gear selector all the way to its rightmost position. This helps to extract the most from the engine’s new higher-pressure fuel injection system that features upgraded injectors, while it becomes easier to feel the quicker turbo response caused by a new exhaust manifold that’s now integrated within the cylinder head, a move that improves warm-up times as well. These latter features benefit both new Ingenium engines, whereas the high-output version gets an upgraded turbocharger with better bearings to improve power, response, and efficiency. Considering its sizeable performance advantage over most rivals the high-output Discovery Sport’s 11.7 L/100km city, 9.3 highway and 10.6 combined fuel economy rating is impressive, while the base Disco Sport gets a Transport Canada-claimed 11.4 L/100km city, 9.3 highway and 10.5 combined fuel economy rating that fits right within the compact luxury SUV sweet spot as well, and is especially good when considering it’s a larger than average compact that comes standard with off-road capable four-wheel drive. An Eco mode can help you achieve such numbers, as will its standard auto start/stop system that shuts down the engine when it would otherwise be idling. Four-by-four prowess is the brand's promise no matter the SUV purchased, and one that rings true to my adventure loving heart. Thanks to a nature addicted dad I grew up enjoying most summers on the trail, not to mention plenty of autumn, winter and spring weekends heading to our family cabin, which required a worthy off-road vehicle at the best of times, so 4x4 capability is a must-have, whether touring the backcountry during summer vacation or hitting the slopes mid-winter. To achieve such feats the Discovery Sport comes standard with the very competent Terrain Response system, but it’s not the brand’s classic centre transfer case with locking differential setup. Instead it features a first gear ratio designed to limit launch speed so as to slowly crawl out of slippery situations or over obstacles, and even sports an available low-speed off-road cruise control system dubbed All Terrain Progress Control. Terrain Response modulates the engine, transmission, differentials, and chassis systems after selecting General Driving, Grass/Gravel/Snow, Mud/Ruts and Sand modes to overcome just about any challenge, thanks in part to 211 millimetres of ground clearance. All of its 4x4 capability is selectable via a row of switches on the centre stack, making this an easier than average off-roader to master. While capable off-road, the Discovery Sport is hardly a bruiser when it comes to ride quality and is no slouch through the corners either. I took plenty of opportunities to push my tester to the limit, the result being rock-solid confidence-inspiring stability even when the roadway below its 245/45R20 Continental Cross Contact winters was less than ideal. Likewise, it delivered a comfortable, compliant ride, this partially due to its long 2,741-mm wheelbase that helps to smooth out uneven pavement. If you want the more energetic new engine you’ll first need to step up to $47,200 HSE or $51,200 HSE Luxury trim and then add $6,100, which means that along with Dynamic exterior styling upgrades including a sportier front fascia design with deeper air intakes, larger 20-inch alloys and other trim modifications all around, as well as some interior styling enhancements, the HSE gets HID headlights with LED signatures, auto-dimming side mirrors with memory, a fixed panoramic sunroof, a heatable sport steering wheel, driver’s seat memory, perforated leather upholstery, heated front seats, front parking sensors, a garage door opener, and more. On top of this my tester’s cabin was fitted with an Ebony and Pimento colour scheme, a truly unique no-cost upgrade that even goes so far as to wrap each side of the centre stack with pimento metallic trim, while the Ebony headliner added $410 to the bottom line. More useful, a $2,960 Entertainment package upgraded the centre touchscreen to 10 inches and enhanced its capability with 4G Wi-Fi and more, plus improved audio quality from the base 10-speaker stereo via an awesome sounding 825-watt 17-speaker Meridian surround sound system that includes proprietary Meridian Trifield technology. More practical is the $1,480 Convenience package that added proximity keyless access, an auto-dimming rearview mirror, a Homelink garage door opener, and a powered gesture liftgate. Alternatively you could choose HSE Luxury trim, which adds the keyless access, auto-dimming mirror, and gesture liftgate, plus some unique exterior trim bits, illuminated aluminum treadplates, upgraded interior trim, navigation, a 380-watt 11-speaker Meridian audio system (or the option of the larger infotainment display and higher end audio system for just $2,150), and higher grade perforated Windsor leather upholstery with contrast stitching and piping, which is a nice move up from the base model’s partial leather upholstery, although take note that the more supple leather is standard with the regular HSE when opting for the more potent engine. All of my tester’s upgraded bodywork was finished in $670 Santorini Black metallic paint, while additional upgrades included the aforementioned $1,430 Driver Assist Plus package, plus satellite radio for $460, a load space cover for $180, and $835 worth of rubber winter mats and wheel locks resulting in a final total of $61,725 before freight and fees. Over and above everything already mentioned, my tester included much from the base Discovery Sport that comes impressively equipped with trailer stability assist, auto on/off headlamps, power-folding heatable side mirrors with approach lamps, an electromechanical parking brake, pushbutton ignition, a leather-wrapped steering wheel, rain-sensing wipers, a colour multi-information display, dual-zone auto climate control, rear parking sensors, a rearview camera, powered front seats, three USB ports with charging, Bluetooth phone connectivity with streaming audio, ambient interior lighting, all the expected active and passive safety features including an airbag for the driver’s knees, plus more, making that previously noted entry-level price all the more enticing. It would’ve been possible to dress up my Disco Sport HSE tester even further with myriad 19- and 20-inch alloy wheels, more $670 metallic colours, a more exclusive $1,640 palette of paints, the roof pillars and rooftop finished in grey for $670, and a different no-charge interior motif, while the $1,230 Vision Assist package adds adaptive cornering headlights with auto high beams and a surround parking camera. It could have also included the $1,990 Intelligent Dynamics package that features the brand’s Active Driveline and Adaptive and Configurable Dynamics, the former automatically disengaging rear-wheel drive when not needed in order to save fuel or alternatively engaging four-wheel drive within 300 milliseconds when required, and the latter incorporating MagneRide to monitor the SUV’s movements at least 1,000 times per second and then adjusting the dampers to minimize body roll and improve ride quality, performance and safety whether on- or off-road. Plenty of extras can be added individually too, such as a head-up display, ventilated front seats, heatable rear seats, navigation, configurable ambient lighting, semi-autonomous self-parking, and more. 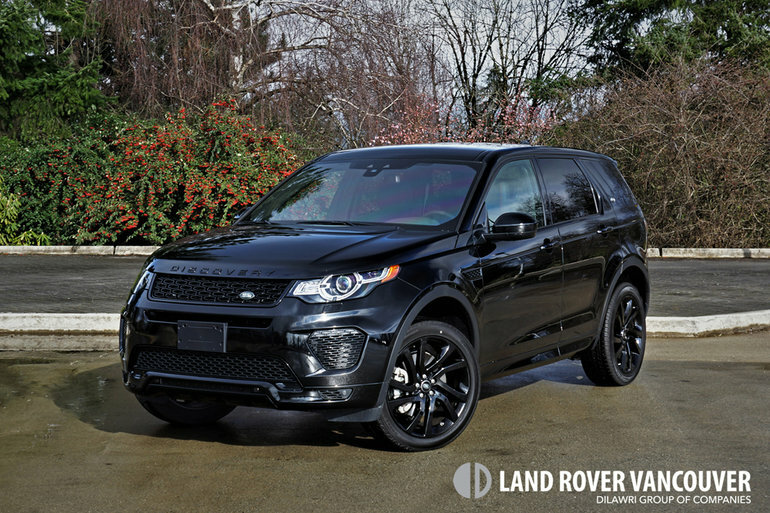 The ability to personalize the Discovery Sport really helps it stand out in an ever-growing crowd of compact luxury SUVs, but its attractive styling, sporty performance on and off the road, thrifty fuel economy, accommodating interior, impressive quality, and excellent value do even more to increase its popularity year after year. To learn more about the updated 2018 Discovery Sport or take one for a test drive, contact Land Rover Vancouver at (604) 738-5577 or drop by the showroom at 1730 Burrard Street, Vancouver.